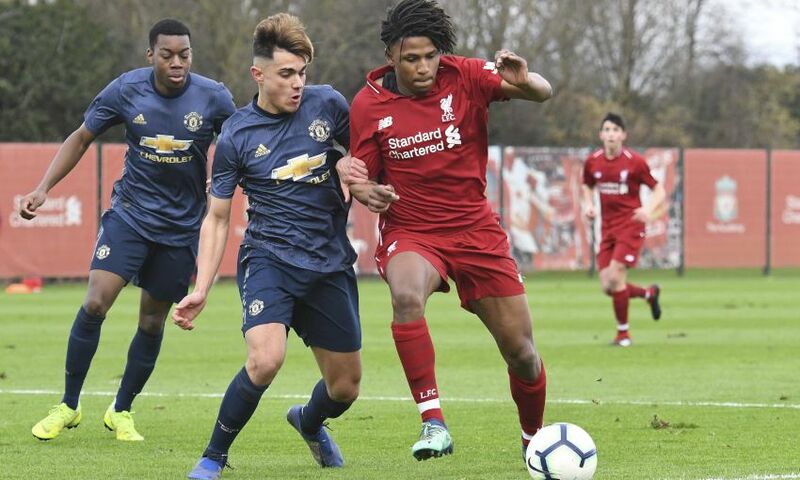 Ten-man Liverpool U18s were cruelly eliminated from the Premier League Cup as Manchester United claimed a 3-2 win in their quarter-final at the Academy. 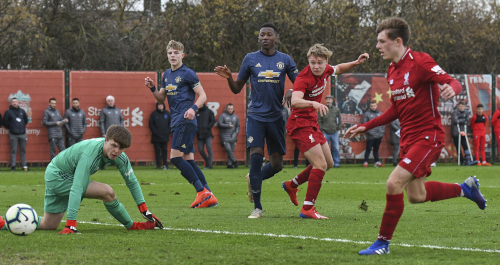 The young Reds had established a two-goal lead in an incident-filled last-eight tie courtesy of efforts from Paul Glatzel and Bobby Duncan either side of half-time. But Morgan Boyes’ dismissal just before the hour mark gave United hope – and that was increased instantly when Mason Greenwood swerved in a fine free-kick. 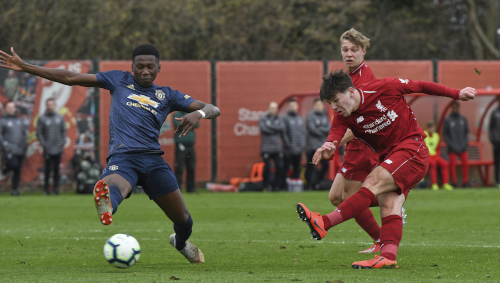 An equaliser by Teden Mengi forced extra-time and despite Liverpool’s determined exertions, another unstoppable Greenwood set-piece sent the visitors through. Each side used the opening 10 minutes in Kirkby to suss the other out, but the spell of mutual caution soon made way for a flurry of chances. Glatzel created the first for Liverpool, the FA Youth Cup hat-trick hero on Monday night trying to turn provider for strike partner Duncan after fashioning space in the middle. The pass into Duncan in the right side of United’s penalty box was well judged but the forward’s first touch was heavy enough to let James Thompson rush from goal and block. The Reds’ goalkeeper, Vitezslav Jaros, was forced into an even more impressive intervention just moments later, when Largie Ramazani threatened. United’s No.11 dipped into shooting territory from the left edge of the area and snapped away a strong effort that Jaros reacted smartly to push over the target. Now there was a zip to the game and the hosts came closest to a deadlock-breaker with a move founded on the kind of speedy passing that had previously been absent. Elijah Dixon-Bonner’s thread through teed up Duncan on the left for a low hit back across goal that Thompson thwarted with his legs. Jimmy Garner lifted a presentable opportunity over from 20 yards at the other end, before Anthony Elanga drew another vital save from Jaros after an injection of invention from Dylan Levitt. Duncan flashed a strike wide from Yasser Larouci’s slide-rule assist, while Greenwood was almost successful for the visitors with a punt aimed for a yard inside the right post – with Jaros alive to the danger again. A goal felt inevitable, though, and it was Liverpool who got it. Another flowing attack by the Reds released Glatzel inside the box and the referee immediately pointed to the spot when he tumbled under challenge. The 17-year-old took responsibility from 12 yards himself and saw his kick towards the bottom right corner saved brilliantly by Thompson – but reacted quickest to angle the rebound home for 1-0. The second half mirrored the first, with a period of relative inaction during the early stages followed by the pivotal moments of the entire encounter. Liverpool doubled their advantage with 57 on the clock. Another clinical passage of play featured key build-up work from Leighton Clarkson and Glatzel to eventually present an unmarked Duncan with a tap-in, his 20th goal of the season. But the Reds’ joy was quickly punctured by a double setback; it began with the straight red card shown to Boyes, who made no complaints after preventing Ramazani from running clear one-on-one. And Greenwood compounded the situation by dispatching the subsequent free-kick perfectly inside the left hand post, halving United’s deficit and hauling momentum behind his team. Liverpool dug in, however, and Barry Lewtas resisted the temptation to sacrifice a forward when he reshuffled his backline, ensuring their counter-attack threat remained. Duncan nearly restored the Reds’ cushion when he bettered the goalkeeper’s leap from Jake Cain’s corner and headed down, only for the ball to be cleared off the line. Instead, it was the away team next to alter the scoresheet. Jaros had produced another reaction save to deny Di’Shon Bernard’s header but Greenwood delivered a follow-up cross for Mengi to force an equaliser home. From there, the pattern was set: Liverpool’s massed ranks stubbornly took up the task of keeping United at bay while looking to break away when possible. The ploy worked and the tie was still in the balance heading into extra-time, though the pressure from the visitors – with Greenwood at the heart – was relentless. And it was the United No.9 who sealed the Reds’ heartbreak; he whipped another precise free-kick into the top corner on the stroke of half-time in extra-time. Glatzel was inches away from a dramatic leveller when a set-piece delivery was diverted to the back post, but Lewtas’ charges valiantly bowed out of the Premier League Cup. Liverpool U18s: Jaros, Walls, Larouci, R. Williams, Boyes, Ritaccio, Dixon-Bonner (Cain, 66), Clarkson (Savage, 63), Glatzel (O’Rourke, 106), Duncan, Longstaff. Unused substitutes: Bearne, B. Williams.